Did you know, how it came that the ox and the donkey stood next to the holy crib in the stable of Bethlehem? Archangel Michael had been commissioned by the Archangel Gabriel to choose two suitable animals to stand right next to the holy crib. The lion was the first to push himself forward: “I am the king of the animals” he said” I am not afraid of anything”. In order to prove it, he shouted vigorously as only a real lion can do. „I tear anyone who gets too close to the baby Jesus!“ The lion added. 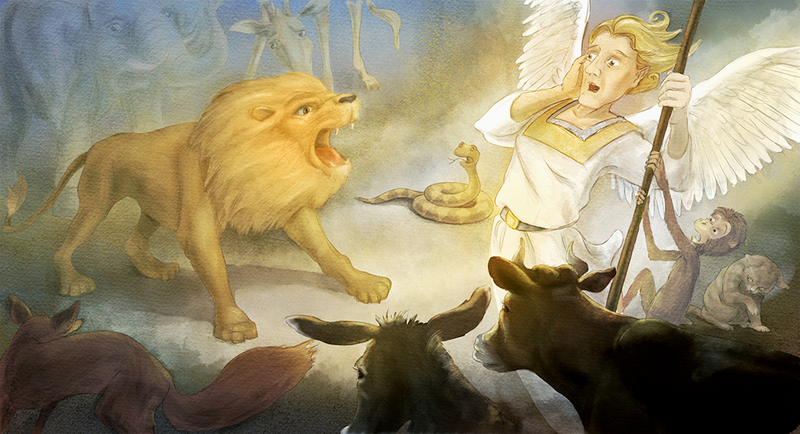 But Archangel Michael shook his head, no one should be afraid or lose his life if he wanted to see little Jesus. The monkey was to restless, the fox a little to cunning and furthermore since no thieves had to be chased also the dog did not fit. Nearly all animals had come forward and presented their unique skills to Michael, as he suddenly spotted two shy animals in the far back and asked: “Why did you two not come forward and introduce yourself?”. „Oh, Archangel Michael,“ replied the donkey. „We have learned nothing and can only carry loads and pull carts. We also do not scare anyone, because we are peaceful, modest creatures. „The donkey‘s ears hung sadly and the ox looked very sad.